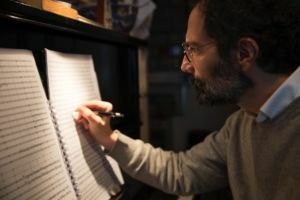 Nicola Campogrande, born in Turin, Italy, in 1969, is regarded as “one of the most interesting italian composers of the young generation” (Amazon.com). Since 2017 his music is published exclusively by Breitkopf & Härtel. After graduating from the Conservatories of Milan and Paris, he began to develop an original personal style, combining past and present traditions on a fascinating new path. Performing his scores, such musicians as Gauthier Capuçon, Lilya Zilberstein, Mario Brunello, Roberto Abbado, The Saint Paul Chamber Orchestra, The Orchestre National d’Île-de-France, the Fine Arts Quartet or the Quartetto del Teatro alla Scala have appreciated the freshness and the vitality of his music as well as his ability to touch the heart of the listeners. A musical theatre enthusiast, he wrote the operas De bello gallico, #Folon, Opera italiana, Macchinario, Lego, Alianti. He also developed a rich orchestral and chamber catalogue. Among his most appreciated scores there are the Concerto for audience and orchestra, R (A portrait for piano and orchestra), 150 Decibel, for cello and piano, Urban gardens for piano and chamber orchestra, the Ink-jet preludes for guitar, the Danze della signorina Olivia, for violin and piano, the Dances of Launghter and Forgetting for accordion and piano. His music is recorded on more that 30 cds (from DECCA to independent labels) and it is performed frequently in the most prominent halls of many countries. The Royal Albert Hall and the Wigmore Hall in London, the Teatro alla Scala, the Opéra Royal de Wallonie in Liège, the Werner Hall in Cincinnati, the Philharmonie and the Unesco Auditorium in Paris, the Auditorium Santa Cecilia-Parco della Musica in Rome, the Rudolfinum in Prague, the Auditorio Stelio Molo in Lugano are recent venues. The artistic director of the MITO SettembreMusica festival, Campogrande is also a host on Italian RAI Radio3 and he produces the TV program “Contrappunti” on the Classica HD Channel. He writes on the cultural pages of the newspaper Il Corriere della sera. He has been a member of the International Music Commission of the European Choral Association – Europa Cantat, where he’s now Advisor. He’s book Occhio alle orecchie. Come ascoltare musica classica e vivere felici (2015) reached six editions.